Heat oil in a large skillet over medium heat. Cook onion for 3 to 5 minutes or until softened. Add chicken and cook, stirring occasionally until no longer pink. Sprinkle with taco seasoning mix, and stir in 1/2 cup (125 mL) water. Cook, stirring for 5 minutes or until sauce has thickened slightly; remove from heat. Place soft tortillas on work surface. Divide and evenly spread refried beans on tortillas. Divide chicken mixture among tortillas, and spoon along one half of each tortilla. Using 1 cup (250 mL) of the shredded cheese, divide and sprinkle evenly over chicken on each tortilla. Spread taco sauce packet contents on the bottom of a 9x13-inch (23x33 cm) baking dish. Roll each tortilla up jelly-roll-style, beginning at the end with the chicken. Place rolled tortillas seam-side-down in baking dish. Spoon taco sauce from jar evenly over tortillas. Sprinkle with remaining cheese. Cover with foil and bake in a 350°F (180°C) oven for 25 minutes; remove foil and bake 10 minutes longer or until heated through. 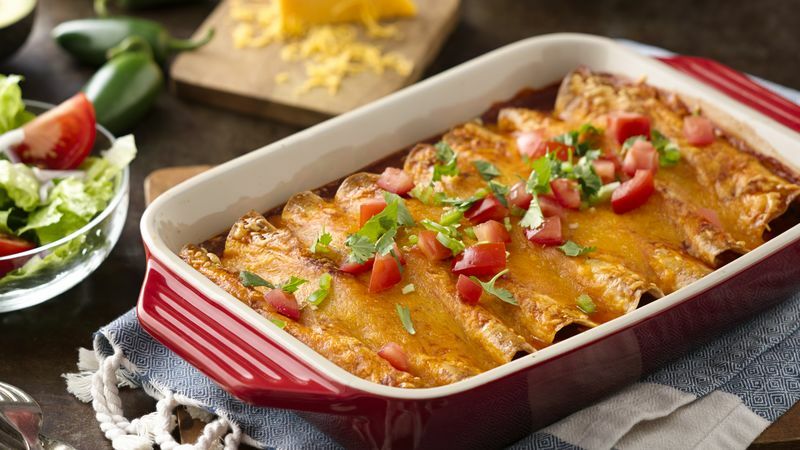 Tip: You may prepare and refrigerate this easy Mexican casserole up to 4 hours ahead of baking time - be sure to let stand 30 minutes at room temperature before baking or add 10 minutes to the bake time.